Android POS Retail Package Setup Guide. Fully featured POS and inventory control for your retail outlet. From the small merchants to larger retailers, the Retail POS & payments package enables sales to be processed in store and on-the-go. 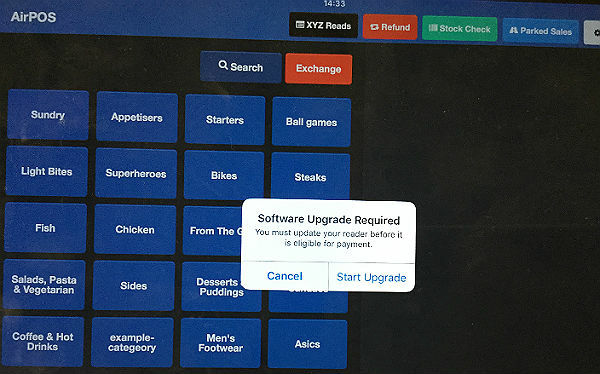 Suitable for use in retail outlets, this fully functional POS solution gives you the ability to process transactions, control inventory, take secure card payments and use powerful analytics to help grow your business. A Star Wi-Fi receipt printer, no wires required. Please note that the package price does NOT include an Android tablet. As part of the Retail POS pack, all chargers and cables are supplied including the PayPal power supply as well as a micro USB 90 degree charging cable. The first thing to do is setup your printer and cash drawer. Power the printer on and press the 'Pair' button at the back of the printer until the blue light flashes, as shown in the diagram below. Press the WPS button of the access point or router. When the printer connects to the network, it will self print the connection information and its blue light will change from flashing to solid blue. The self print from the printer with it's connection information should look like the following. NB: WPS (Wi-Fi Protected Setup) is a standard for making easy connections between wireless networking devices. Depending on the manufacturer of your router, buttons that have been displayed as "AOSS", "Easy wireless start", "JumpStart" etc. may also be handled equivalently to WPS. 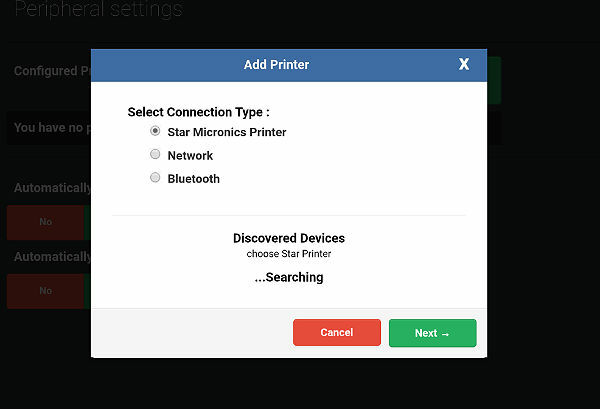 After you have connected your printer to your own network the AirPOS application will be able to find the printer. Open the AirPOS POS and go into settings by clicking on the grey cogwheel icon at the top right of the screen. From the left navigation panel click on ‘Peripherals’ and then press the green ‘Add printer’ button. After a moment the popup will change to show all Star network printers found in a blue box with their IP Address. Tap on your printer when it appears and then tap on the 'Next' button. A new popup window will open to prompt you for the Printer Type. From the menu select ‘Star Raster Printer (TSP100 series)’. Run a test print just to confirm everything is working then press the 'Use this printer' button to save your selections. Now that your printer and cash drawer are connected the next step is to setup your barcode scanner. The CT10 handheld barcode scanner works as if it is an external bluetooth keyboard. It just simply feeds the scanner results to your device and wherever the cursor is, the characters will be “typed” there with a “return” sent. The CT10 Barcode Scanner supports USB data transmission. The user just needs to connect one end of the USB cable to a device with USB 2.0 port and the other end to the CT10 Scanner. Open a text box and scan a barcode off a book or something and it will transmit the data. NB:There are known Bluetooth connectivity issues when running the Spotify App with AirPOS. Attached Bluetooth peripherals (Card Readers, Printers, Barcode Scanners, etc) may regularly drop connection resulting in receipts not printing, drawers not kicking and aborted card transactions. ‘Restore Factory’ is a special barcode to restore factory defaults. The scanner will respond with a short high toned beep after scanning this barcode and be restored to it’s factory defaults with no need to scan the “Exit with Save” barcode. The PIN defaults to 10010. Turn on Bluetooth in your Android device and click on the CT10 when it appears in ‘Available devices’ in order to pair it. Your Android device will show a pop-up request to ‘Pair’ with the scanner and a prompt for a PIN. 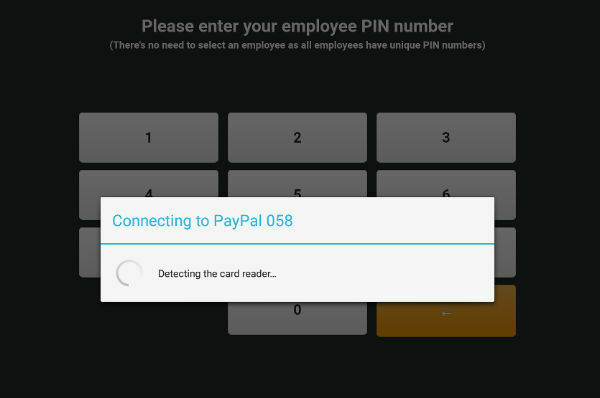 Enter 10010 (default PIN) to pair. 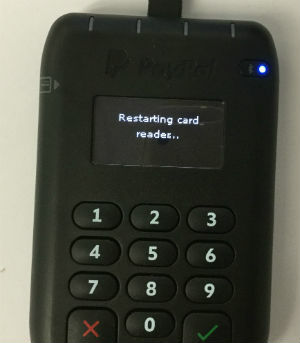 Now that your printer, Barcode Scanner and Cash Drawer are connected the next step is to setup your PayPal Here Contactless ‘Chip & PIN’ card reader. Click on the link below or scroll down to setup your card reader. Setting up PayPal Here Payments (If Applicable). We assume that you have already set up an account with PayPal Here if you are using PayPal with an Android tablet. You will need a business account and have it enabled by PayPal to accept PayPal Here payments. If you do not already have a PayPal business account you can sign up for one at the following link. In order to pair your PayPal Here device with the Tablet, you will need to switch on the PayPal device. 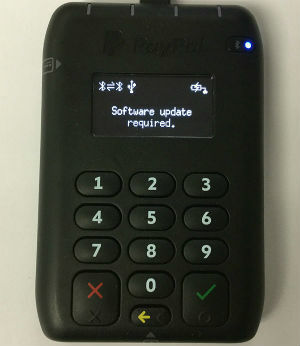 For the PayPal M10 device (black device with a large black PayPal logo at the top) press and hold the blue power button which you will find on the top right of the card reader (see the diagram below). 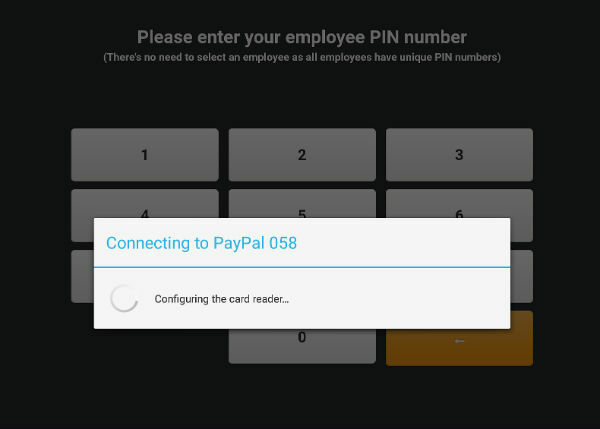 When you turn on the card reader it's screen will display a starting up message followed by the instruction to open the PayPal Here application on your tablet. You don't need to open the PayPal Here application and you can ignore this instruction. Setting Up Your C Frame Tablet Stand and Cash Drawer Enclosure. The C Frame tablet enclosure for iPad and Android consists of two components, a 10" Universal tablet stand and a cash drawer enclosure that the stand attaches to for security and ease of use (Not included in this package). The cash drawer enclosure helps to protect your cash drawer as well as providing a secure base for the tablet stand, with a rotation feature allowing the tablet stand to move around as required on a solid base.